Written by myself, in regards to the common perceptions of self worth in today's society. One thing I loathe about society is our inability to self-praise. The connotations attached to self-confidence and self-worth leave us fearful of shouting our own praises. Often doing so is labelled as ‘vein’ or ‘big headed’, something that couldn’t be further from the truth. My aim in life is to show people that if we build ourselves firm foundations of self-love and adoration we then have the best chance at reflecting that in the way we treat others! Society has a pessimistic attitude. From a young age it is drilled into us the importance of constantly trying to better ourselves. Although achievements are recognised it is short lived, soon people are back on the path of ‘bigger and better’. There is a pressure to conform to the unwritten rules of life, people are expected to thrive academically from a very young age. There is a need for parents to show off through their children, which often leads to tension, stress and anxiety in our youth. I chose to share my stance because I am confident in who I am and the way I live. I am passionate in helping everyone no matter what. I make the conscious decision each day to share my life and show that no matter what race, sexuality, gender, ability or disabilities we have, every single person in this world has something to give. Every single person deserves equal chances. Every single person has a right to be heard. I’ve often been asked; “But you know that alone you are just a drop in the ocean, doesn’t that put you off? You care about people in a way you know you will never get in return.” Which is completely true. BUT, what I do know is that I have the ability to plant a seed in someone’s minds. I have the ability to help one person smile, I have the ability to help a person in distress, I have the ability to set the example other young people need. If we all took this attitude the world would be beautiful! I pride myself on doing as much as possible to help others. I am someone everyone knows will be there no matter what time of day or night. I am the person that will chose to make something knowing it will take twice as long and be half the price in the shops. I am the person that doesn’t mind working hard for free because my payment is the thanks I receive and the knowledge I have made someone's life a little easier or more worthwhile. Helping others makes me feel like I have purpose and that I am doing my part to make this world a better place. Helping others should be part of everyone’s day to day regime in my opinion. What use would we be if everyone was just ‘take take take’ with nothing to give? It would be a pretty dismal society. This one I am passionate about. GIVE MORE THAN YOU RECEIVE. Be realistic! If you have time, money, energy, good health, patience, skills or knowledge then why not let others use some of that too? I am a peoples person (some would call it outgoing). I will sit and have a chat with anyone and everyone and truly believe every person has an interesting story to tell if you are willing to give the time to listen. Some would say I am stubborn, I like to call it determined! I enjoy learning new skills, both practically, and psychologically- especially when I know I can them go on to use those skills and help others. I do my best to be upbeat and see the good in every situation. Patience isn’t my strong point but I remind myself often we are all a work in progress! I care about others hugely and I will do all I can to help someone in need, no matter who it is. I love my family- I love the way we unite through the difficult times, laugh through the fun times, share memories for a lifetime and work together as one. I love that each member of my family plays a different role in my life, whether that be my confider, my comforter, my friend or my role model to name a few. 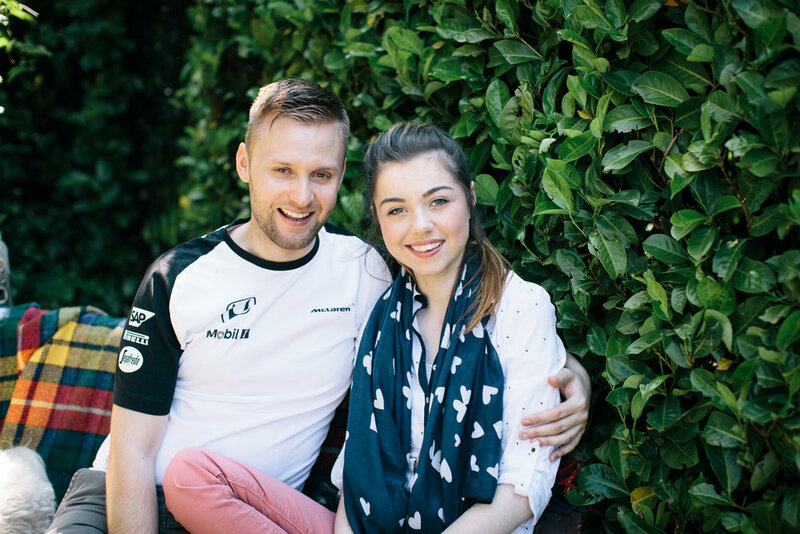 I take comfort from the fact I know my family will never leave me, despite how much we have all been through.My incredible Boyfriend has widened this area of my life, slowly beginning to think about our own family in the future too! I love art, crafts and drawing- I will always have a Pinterest DIY on the go! Whether this be art I create or art I appreciate, I love it in every form. There is something very special about exploring new techniques, I adore gathering together as many materials as possible and sitting down to see where a project will take me. I love that there is no right or wrong in art, it is simply a matter of judgement and opinion. I love that art is such a broad spectrum, there is always something new to explore! I love that so many things fall under the category of ‘art’, but my favourite is creating art in a practical form. I appreciate other people’s work and talent, but I would much rather be getting stuck into it myself. I love that there are no boundaries and no limits to what you can create. With art there literally is no stopping me, I will create something out of scraps and ends, because I believe that little things can be just as magnificent and big things. I love that art can document things just as well as words. A picture can in fact speak thousands of words at once, sometimes emotion comes screaming from the piece and other times it lingers softly in the background making you work harder to try and find out what it is trying to say. I love the natural world- I love how nature is so raw and so perfect before it is touched by mankind. Frosty mornings, bright summer nights, crunchy leaves in all different shades, blossoming trees, the smell of cut grass, the sound of a trickling stream. It is all just so beautiful! I would never change living in the countryside for the world. Whilst the city is the right place for some people I am sure, I will only ever be a visitor! I love waking up in the morning knowing that I am surrounded by beautiful nature, listening to the birds chorus as they let us know the day will soon begin. To me nature is the foundation of life. I take comfort in the fact my lungs are being filled with fresh crisp air and feel blessed to have such stunning surroundings. I love lists, structure and routine- If you walked into my bedroom you would think I am a messy person. I hate throwing things away because I always see a second use in things, I suppose I am good for the environment, but not so much the state of our house! But my mess to me is organised. Other people may not know where things are but I absolutely do (most of the time). I know where to find a piece of lace, some cardboard, a pebble or a bead. I can put my finger on the skirt I wore Tuesday last week (unless my loving Mummy has put it in the washing!) Structure and routine brings me comfort because I know exactly what is going on and when, it lessens anxiety and brings out the confidence in my stride. I do not like it when plans go wrong- this is something I am having to learn to deal with, as it happens very frequently These days! A lesson to learn from bees; dedication, determination, focus and exploration are the foundations to making something incredible! I love capturing precious moments in a photograph, whether that be something significant like a family members wedding or something as simple and spontaneous as a lady bird on a leaf. I love the elderly too. I love that this generation has done SO much for us, and now it is our turn to return the favour and give them the treatment and respect they deserve. I love that the elderly have stories to tell from years ago that you couldn't possibly imagine. They cook the best cakes and give the best hugs. I love that older people are so much wiser and a great to turn to for knowledge and advice. I love the cheeky side older people have- showing glimpses into what they were like as youths. To me it is really important that this page doesn’t involve my illness and that's why this paragraph is last in the list. Illness takes up A LOT of my life, but I refuse to let it in where it is not welcomed. One thing that has become a part of the person I am is being a voice for those that have been silenced by their illness. I choose to advocate for those that don't feel strong enough. I share my knowledge and experiences on the journey I have faced and support others who are similar to myself. I work to ensure that one day people with an illness or disability will not have to feel secluded, vulnerable, the minority, mistreated or misunderstood. Each and everyday I work hard to show that I am still Chloe, my interests, opinions, thoughts and feelings are still as they have always been. Like others they have changed and matured with time, but my core being if still very much the person I have always been and that wont ever be something I will let go of! So, whilst the rest of this website will be to help others, I thank you hugely for spending the time to learn a little about me too. 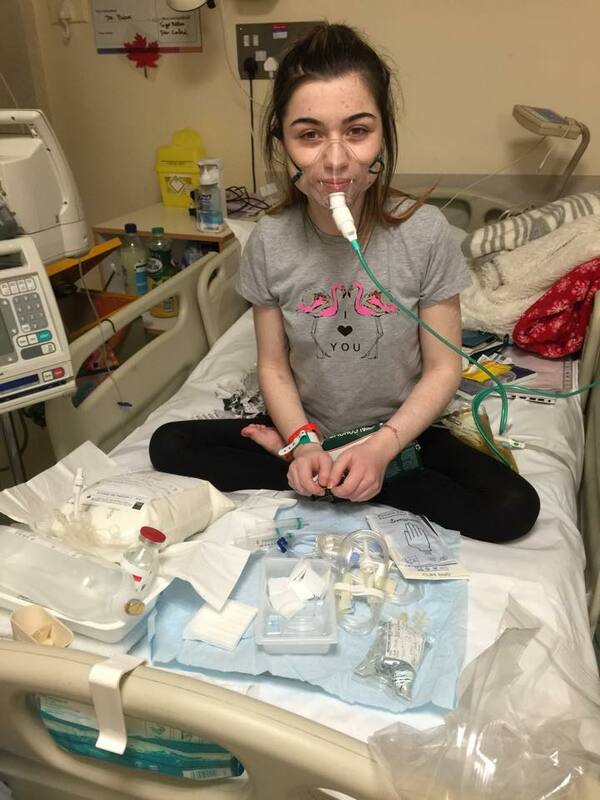 Chloe was discharged from hospital after 7 months at the end of 2014, unfortunately it only lasted 2 months before she was admitted again, very unwell. Post-Surgery feeling very sore and spaced out. Here Chloe was reacting to a medication she had been given, a rash she see's very often due to having a Mast Cell Activation Disorder. Chloe needs oxygen very frequently now. Her body simply cannot maintain levels and when she has seizures or collapses these levels dip further, which could cause major damage. 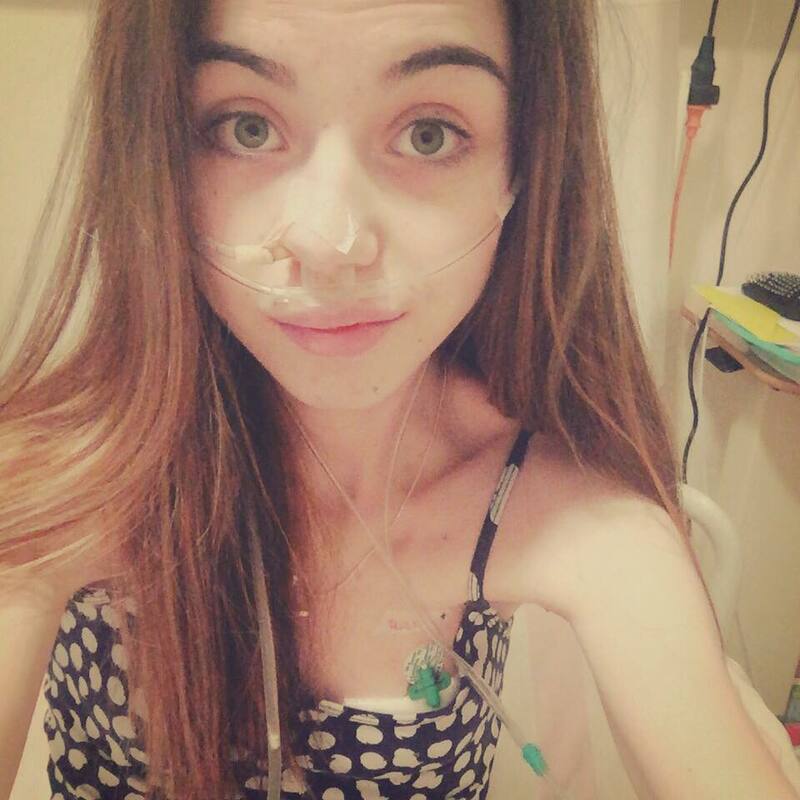 This was the first time Chloe had TPN, before trying one last time to feed into her gut. 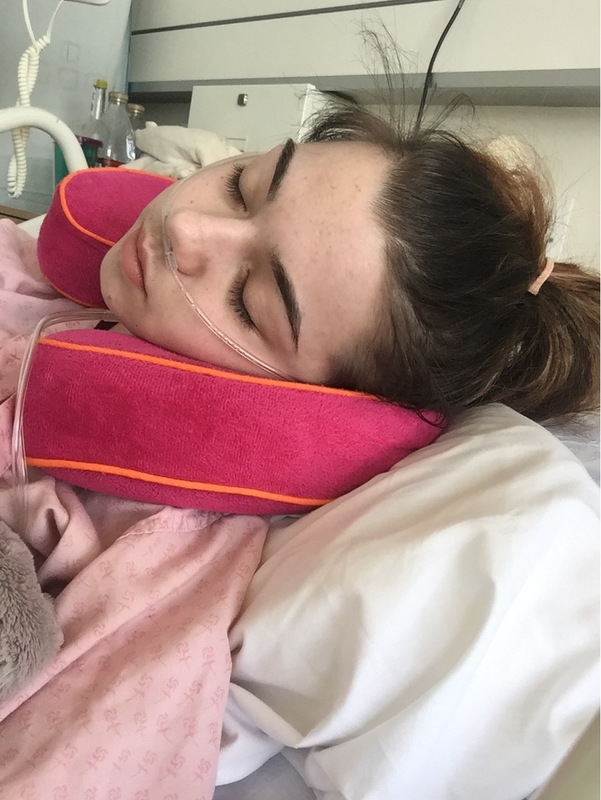 This didn't go as everyone had hoped for Chloe and she had to be commenced on TPN once again and established at home with this method of feeding. 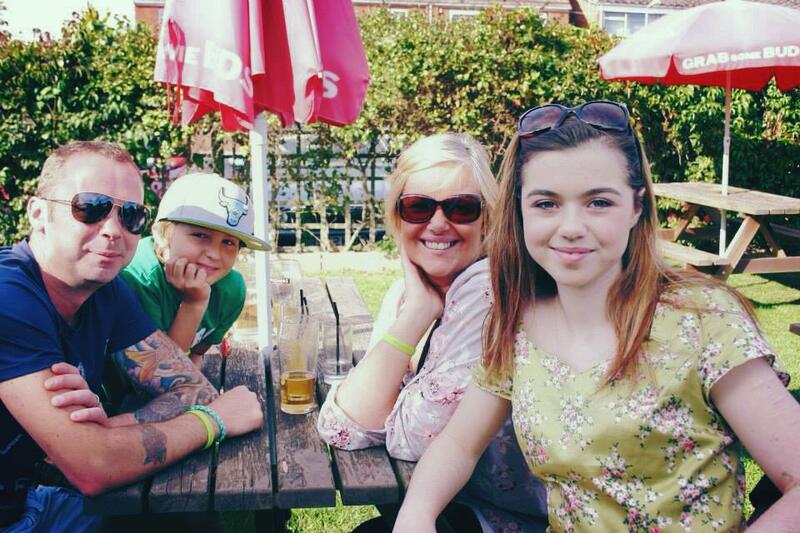 2014, Chloe spending precious time with family. 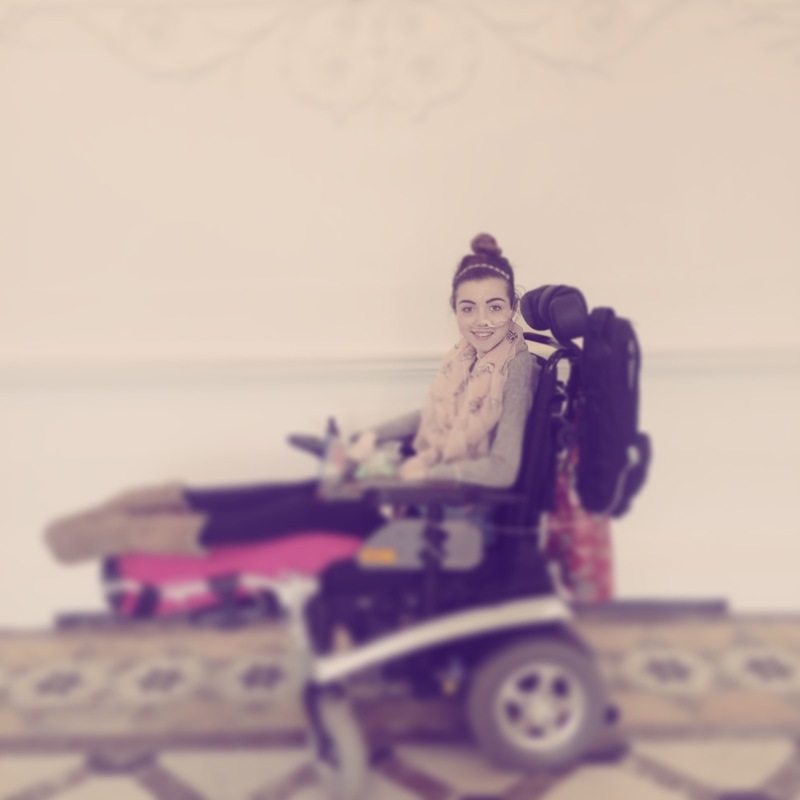 Social Networking and Blogging has been a valuable source of support for Chloe, but also a way she can give to others, sharing advice and support. Chloe having a Mast Cell Reaction. This is a commonly occuring even, but still equally as scary each time. Chloe has now had this tube for over a year and cannot believe how quickly the time has passed. 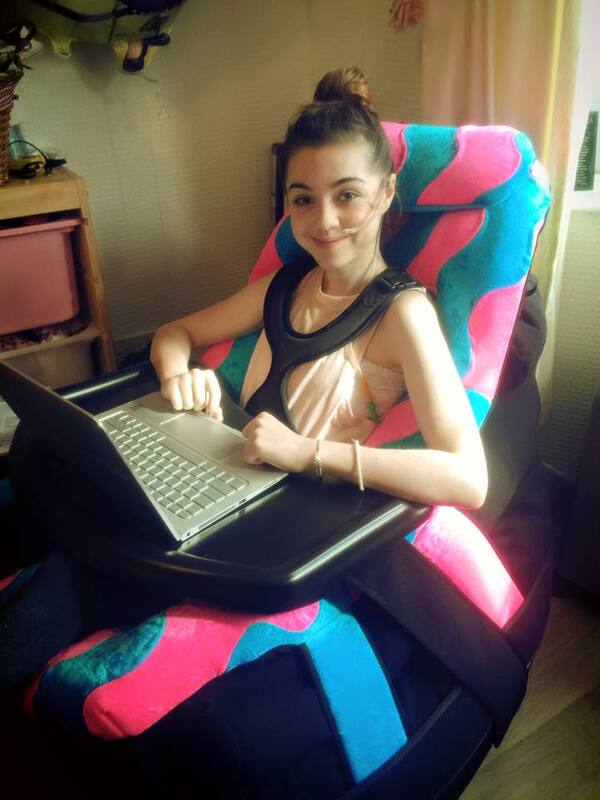 Chloe over the moon to be in her PPOD, a specilist orthotic beanbag created by orthotic services giving her somewhere to sit without causing her unstable hips to have more dislocations. The PPOD has an insert that is moulded to the shape of Chloe's body to ensure it is a perfect fit. Chloe after having her Hickman Line placed to begin long term TPN. 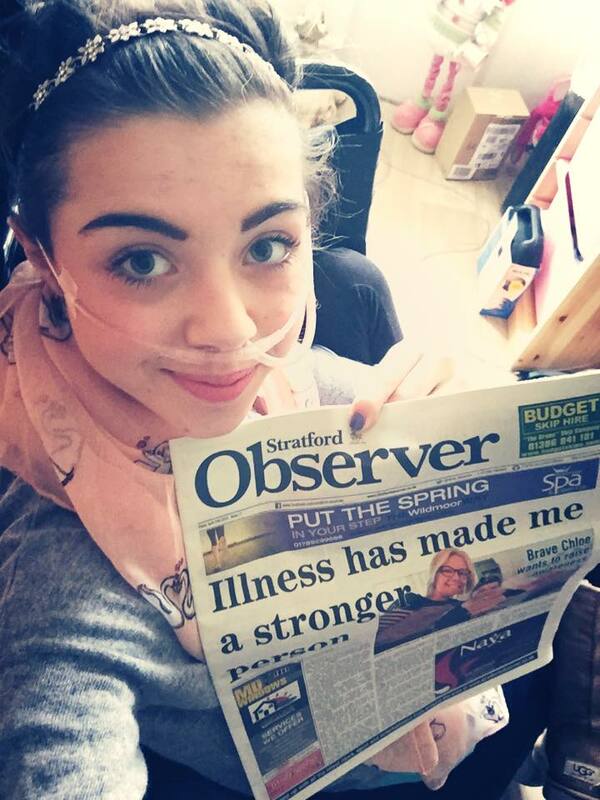 Chloe was on the front of the observer, congratulated for her bravery and giving her a chance to thank the local community for their support. May was EDS awareness month. Chloe always does her bit to raise awareness, in the hopes it will help others. 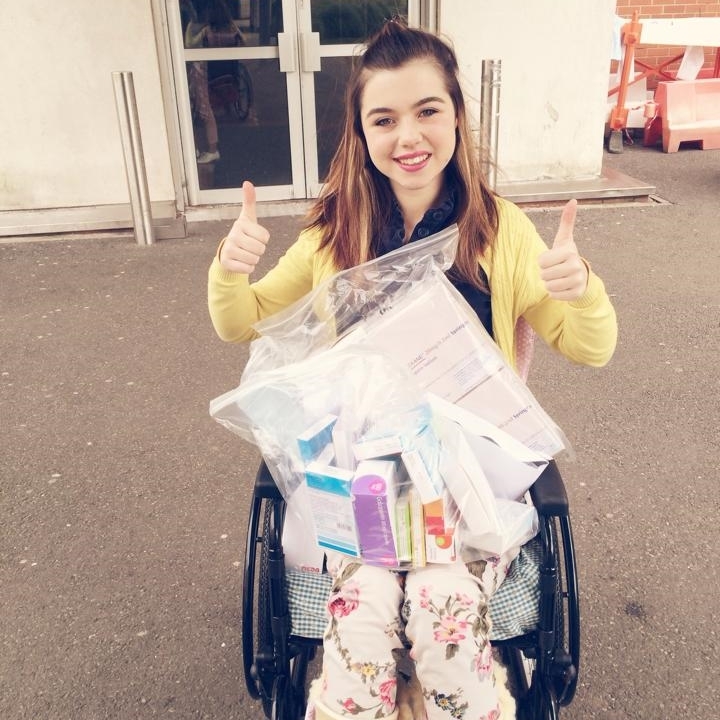 Chloe fell out of her chair during a seizure, having only been left alone a matter of minutes. It only takes a few minutes and Chloe can injure herself. Looks can be deceiving. This was a few hours out whilst Chloe was still in hospital, recently finding out her bladder had failed. Chloe had a hospital appointment in Birmingham, the perfect excuse to take a trip to the custard factory and check out the grafitti! Chloe was very unwell at this point, her body struggling to recover from back to back seizures totalling 12 in 24 hours. Chloe will always try and give a smile, she says it is worth it even if she is having a hard time, to see people smile in return. 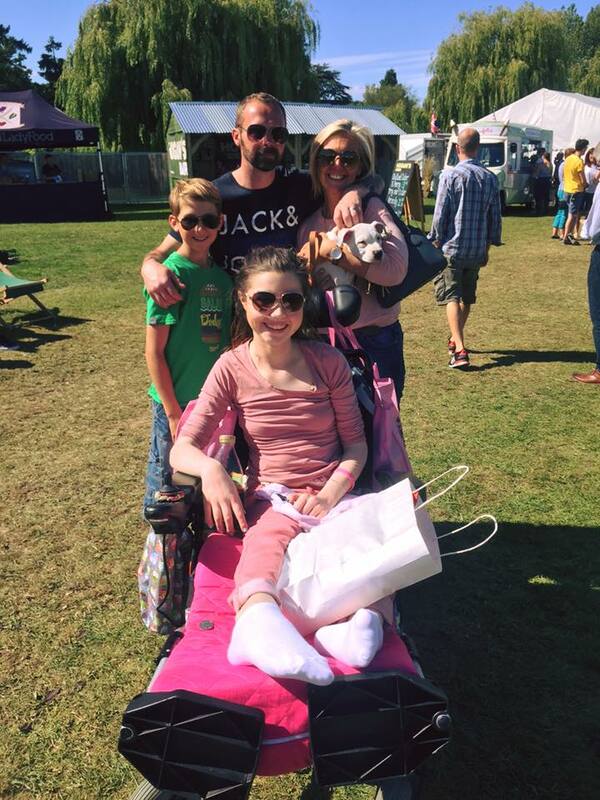 Chloe Spending time with her family at the home and garden show, venturing out for a couple of hours to ease back into being at home after another 6 week admission. Chloe was critically unwell at this time, a scary time for family and friends to remember- whilst Chloe has little recollection. Chloe recommenced Parenteral Nutrition. "I am a warrior and never a victim"
Chloe on Mother's day, she got so excited to see her family all together that she had a seizure. Chloe's final attempt with 'off the shelf' knee braces before it was decided she needed a custom made hip to toe brace to stop her legs dislocating in so many positions. A fantastic weekend away, for the World of Music and Art Festival- with military planning it went very successfully. Chloe recovering after her Suprapubic Catheter was placed. Chloe became severely malnourished during the two months she spent at home Dec-Feb. Her BMI was a worrying 13.1 on admission to hospital and her blood work causing major concern. 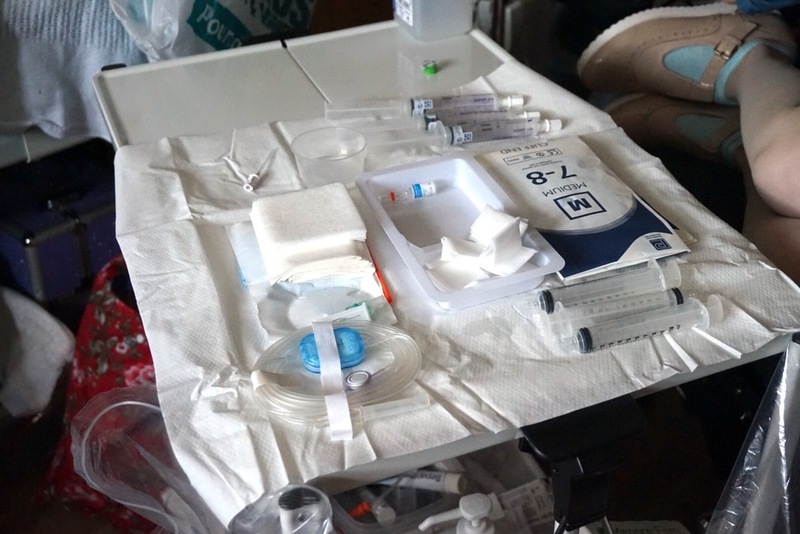 This is the trolley that has to be prepared multiple times a day so that Chloe's Hickman line can be accessed aseptically to minimise infection risk. 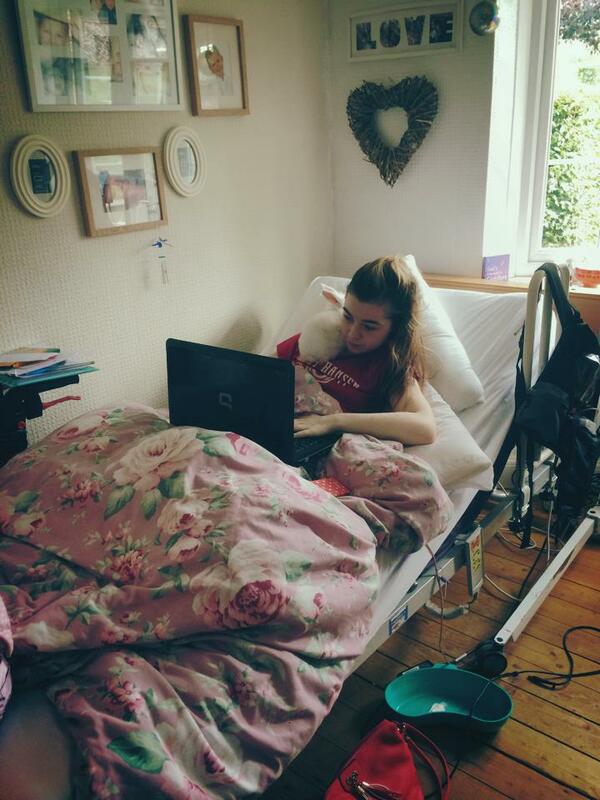 "I try my best to not be ruled by limitations due to my health"
Chloe making sure she is still accessing her line aseptically, despite being in a tent! Somewhere no one ever wants to find them selves, but a place Chloe visits a lot. 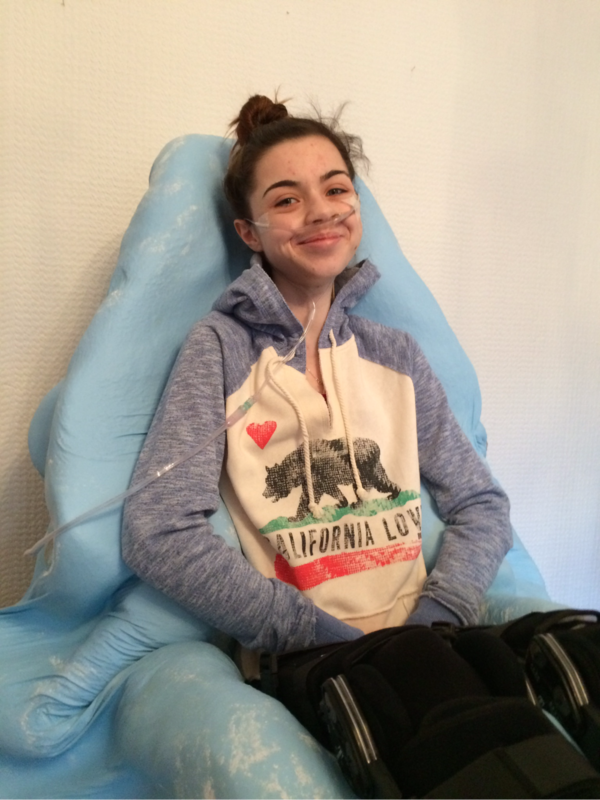 Chloe on high flow oxygen to try and give her a boost, her oxygen always drops when she is too exhausted and her body doesn't breathe but 'pants' instead, not getting the oxygen it needs. Chloe on Hickman 3. First ripped, second misplaced. Third time lucky. 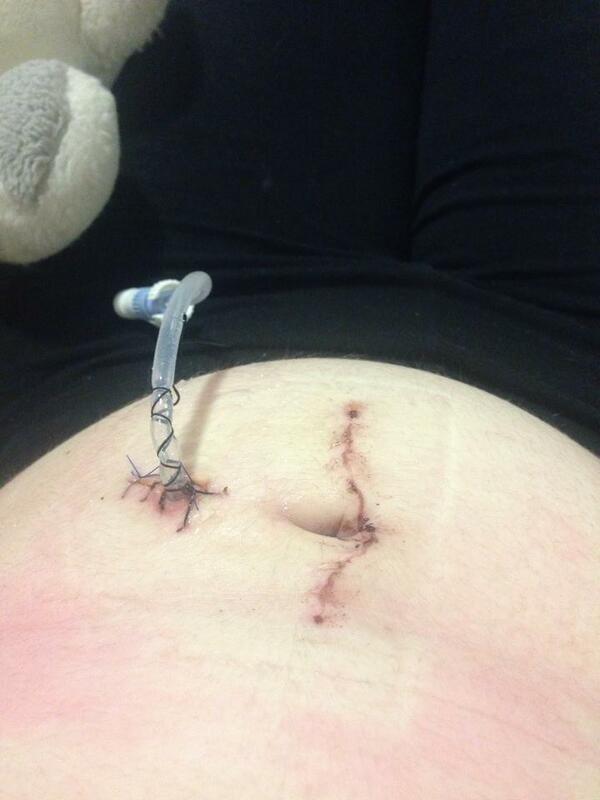 In this picture you are able to see the line 'tunnled' under her skin from where it was inserted. Chloe does a lot of her own infusions. She feel comfortable doing this as it gives her a little independence. This isn't always possible so Chloe's Mum or a Nurse has to take over. A concert was so kindly held by the choir to raise money for Chloe and her family. As a thank you Chloe gave each member of the Choir and individually wrapped rose with a thank you sticker, something she did herself to show how much the kindness is appreciated. Chloe is soon going to have these callipers to wear full time, the last adjustments to make sure they fit absolutely perfectly are being completed currently. The callipers are hip to toe and will fully immobilise every joint in the lower half of her body. 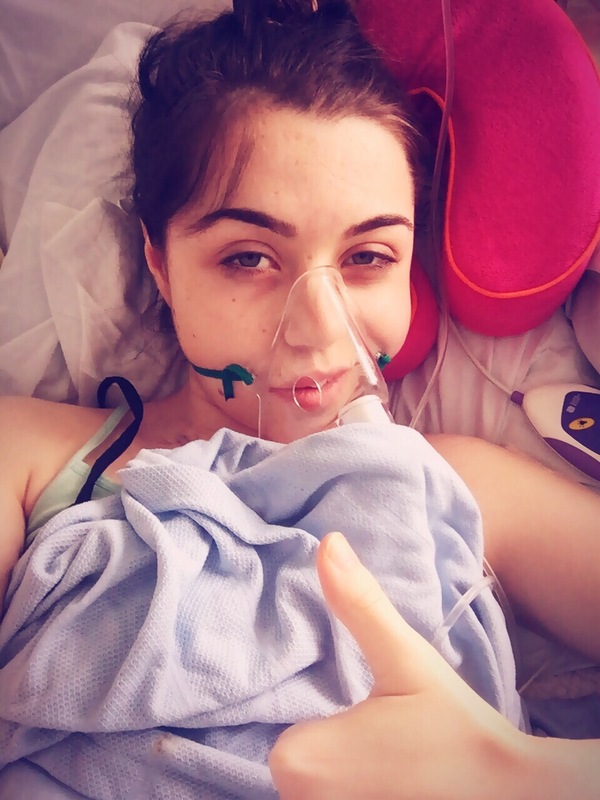 Chloe shows her tubes as a visual reminder of the battle, and highlights that if they were not on show people wouldn't necessarily think there was anything wrong with Chloe's health, which we know is far from the truth. Illness can be invisible and that is something to be mindful of. Chloe making it down stairs in the hospital at the beginning of the year. This was a huge success after a couple of very worrying weeks. Chloe like lots of 20 year olds enjoys the opportunity to do her hair and makeup and choose some nice clothes to wear. This was a trip out for only a couple of hours whilst she was in hospital. Chloe's legs had to be casted so that moulds could be made for her callipers. 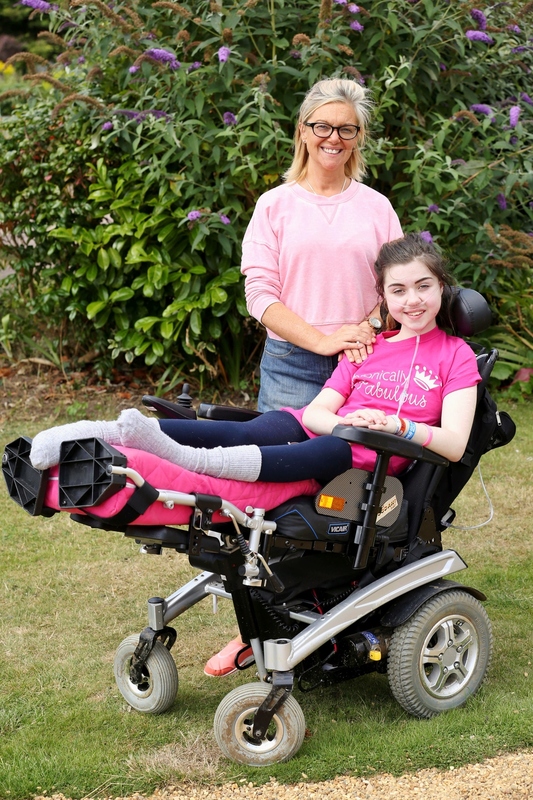 The callipers are a design that has not been previously used by any of the orthotic specialists in the Hospital, but because of how complex Chloe's needs are in regards to her joints, this was the only solution. Waking up after a seizure can be a really scary time for Chloe. She is usually very confused and disorientated as well as having heightened amounts of pain to deal with. At hospital enjoying the sunshine. Chloe has to wear sunglasses a majority of the time, even on cloudy days. This is due to severe light sensitivity. 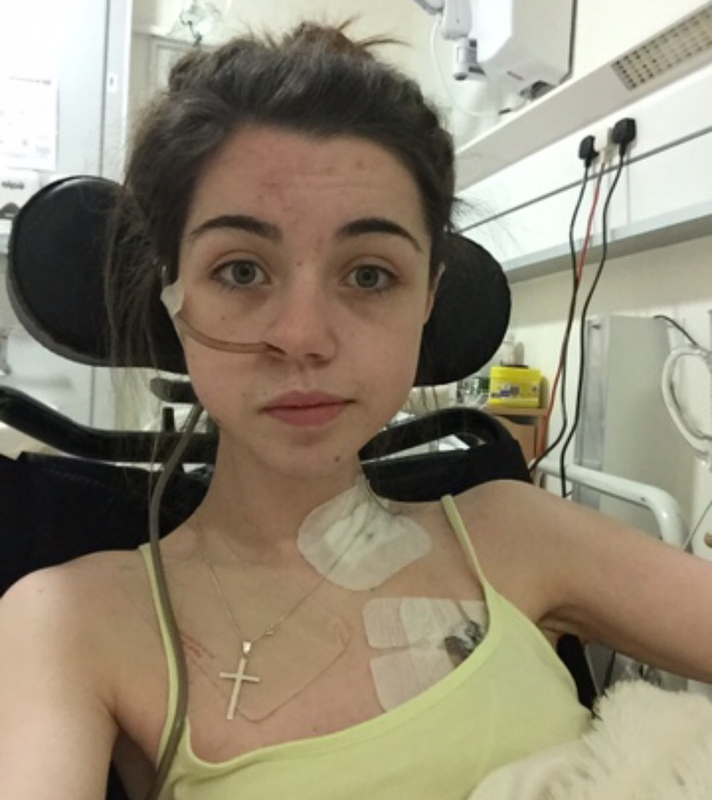 Chloe feels pain from bright lights, as well as making her feel extremely sick and unwell. Chloe after her last operation, suprapubic catheter placement. Chloe had a have a catheter surgically placed into her bladder due to its failure. This is whilst specialists decide what is the best option to manage Chloe's bladder long term. 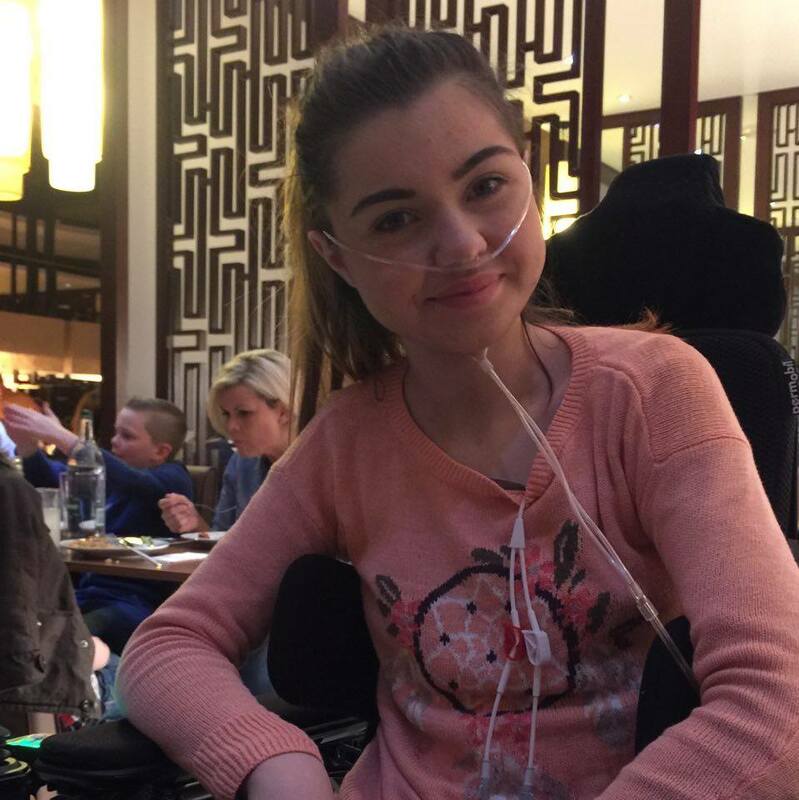 Chloe wearing her sleep study monitors at home, as it was witnessed by family and medical professionals that Chloe becomes very grey during her sleep, with blue discolouration particularly around her lips. 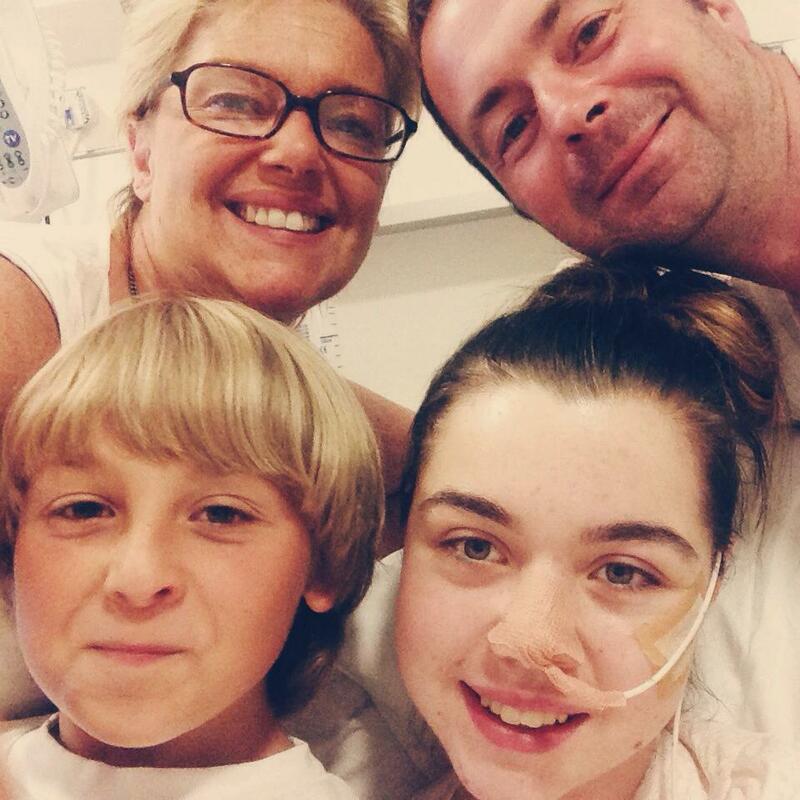 Chloe often gets seizures that come in clusters, a horribly exhausting experience for Chloe. In this picture the round plastic disc into Chloe's nose is a Nasal Airway, that is placed to keep Chloe's airway open and so her breathing can be assisted if needed. The back of milk like substance hanging on the drip stand is Chloe's Parenteral Nutrition. This is 3 litres that is infused from anywhere between 12-18 hours during each 24 hour period. When away from home it is still just as important everything to do with her hickman line is aseptic, meaning everything needed at home has to go on holiday with Chloe also. Chloe giving herself intravenous medication and nutrition whilst camping! 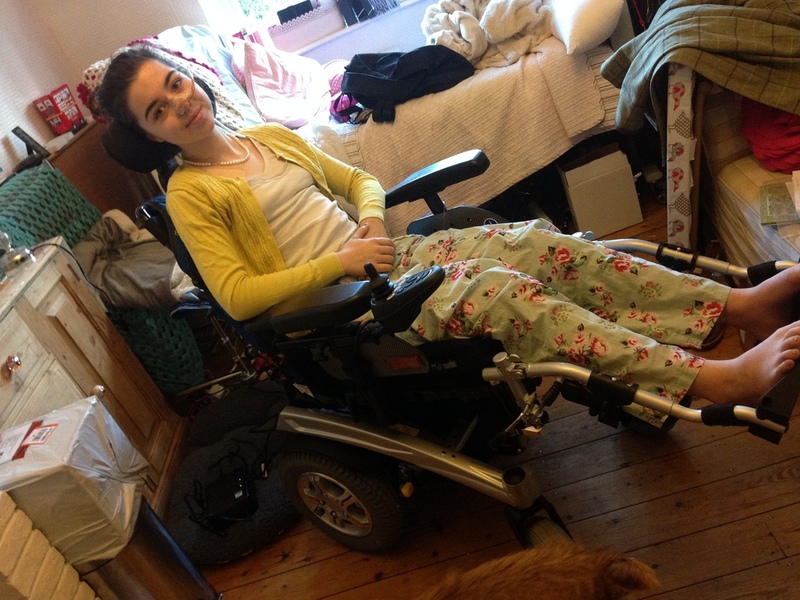 Chloe has to have her feet elevated at all times, which her wheelchair thankfully allows her to do. Without this she would be bedbound. A weekend away with loved ones. 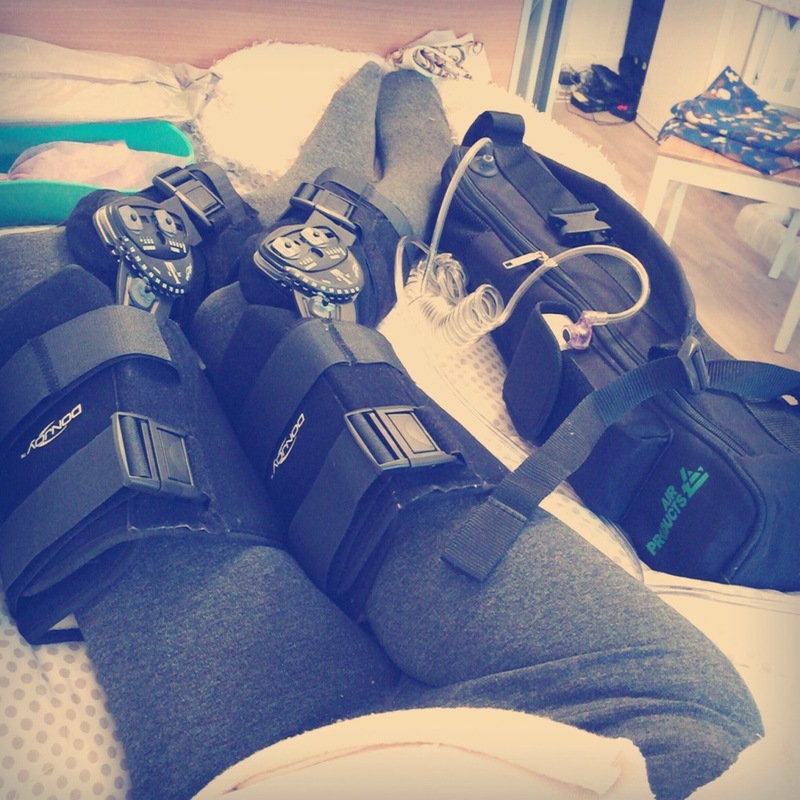 Chloe often refers to herself as bionic, due to the amount of braces she wears to immobilse, support and protect her joints. "A weekend away keeps the Doctor at bay!" 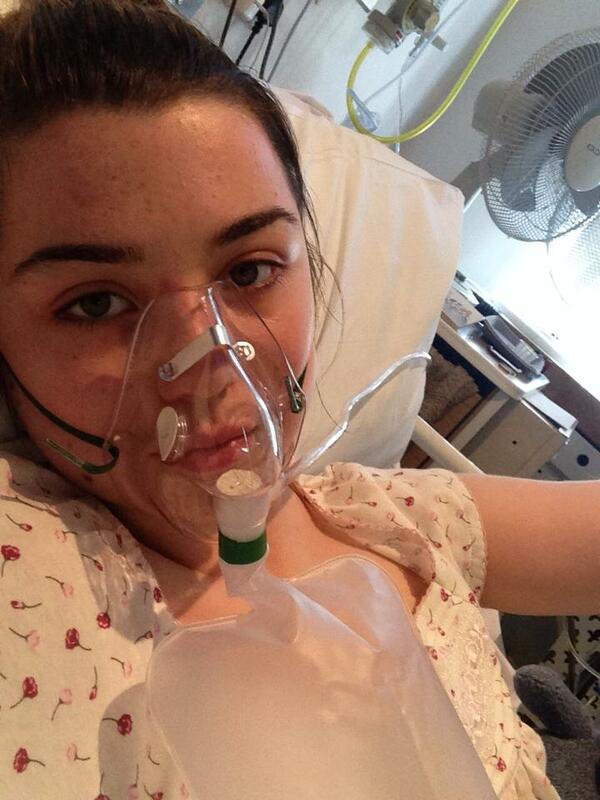 Chloe spent a week in hospital being treated for sepsis stemming from her bladder. Chloe recovering in holiday after lots of very strong antibiotics to treat the severe infection caused by her bladder. Chloe on a recent family holiday to Cornwall. Unfortunately illness doesn't stay at home and Chloe has to spend lots of time playing catch up on rest to try and beat exhaustion levels.